There was a Gingerbread Castle, In the 1960's when I was a little girl,my mother and uncle took my brothers and I there. I remember having lots of fun, My mother is no longer here and my uncle also. I don't know if it's still around but, I would love to take my little neice there. If you or anyone can help me find this wonderful castle, It will be deeply and sincerly appreciated. P.S. It had to be either in New Jersey, Pennsylvania,Upstate New York or Connecticut or Long Island. On Route 23, in Hamburg, New Jersey, you will find the Gingerbread Castle. It was built as an amusement park. I don't know the date of construction, but my father visited there as a child in the 1940's. I visited as a child in the 60's. It is still listed as an open amusment. Gingerbread Castle is located in Sussex County NJ. Off of route 23. It has been there since I was a child. Also known as Jennys Jump. A story told to me by my mother about a girl jumping off a cliff because she couldn't marry the man she loved. It is still open from June through August 29th. For more info. call 973-827-1617. My sister and I visited The Gingerbread Castle in Hamburg, NJ about 10 years ago, and it was in a state of disrepair. Jack and Jill had fallen down the hill and were showing their chicken wire guts. It was a glorious fall in NJ. There was a factory, albeit abandoned, but loved, with a beautiful tiled gated entryway and some thought given to preservation. But the economy obviously could not support it at the time. I remember climbing up to the top of the turret to see the cauldron of bones the witch had stewed up. Pretty scary as a child. Very cool. So, anyone who has an interest in the Gingerbread Castle in NJ can write to me for more recollections. It's easy, I'm Alison.Dahl@worldnet.att.net. Would be happy to rebuild these memories. Yes, the Gingerbread Castle is in Sussex County off of Rt. 23. Personally I have never seen it during the daytime, or looking like a gingerbread castle. Currently, around Halloween, they turn the castle into a "haunted house." It is extremely scary, for someone at any age, but such an awesome experience. You also have to wait on line forever before it's "your turn" to go in, it's very popular around that time of year. I believe that it is still open year round to tour as the Gingerbread Castle. 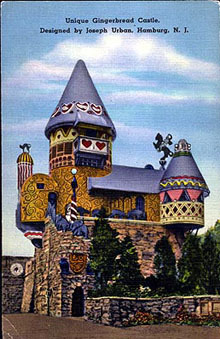 This morning I stumbled onto an old color postcard of the Gingerbread Castle, and thought you might be interested in it, a 2nd view.... and I suppose one more closely resembling his heyday. I grew up in Hamburg, NJ the home of the Gingerbread Castle. Hamburg was known as "The Children's Town" and the Gingerbread Castle was the main attraction to our small town. There was a gift shop with items based on various fairy tales and a small resturaunt named "The Golden Eagle" where my mother used to work as a waitress. There was also a train ride outside with a conductor that would circle a little park. The coup de grace was the tour of the castle. Hansel or Gretel would take you on a tour which included the witch's tower. As a kid you were scared of the witch. There was a lifesize storybook which you could stand in and have your picture taken. And let's not forget the delicious gingerbread men at the snack shop. The factory mentioned in a previous e-mail was called "Plastoid Incorperated". It was the main employer for the town until the mid-80's. The factory made various wire products such as telephone cable. It closed down after the owner's death and his heirs fought over what to do with the factory. It was simply abandoned as was the Gingerbread Castle. The "Castle" as it is now called is a nightclub. It has breathed new life in the old town. It has changed hands a few times but remains a popular place to go on the weekends. It features live music and a large dance floor. My grandmother had a cottage at Lake Mowhawk, so my folks took us to the Gingerbread Castle a few times. My dad has pictures of us and his sister's family, probably around 1960, give or take a year. We are wearing coats, so it must have been cold. When "Hansel" and "Gretel" took you on the tour, they told you that tha walls were made of gingerbread, but if you touched them, they would magically turn to stone! I know this was true, because I did it! Wanted to give you an update on the Gingerbread Castle in Hamburg NJ. My husband and I recently purchased it, and are trying to restore it and bring it back to life. The restaurant (the old reception hall) has been fixed up and is now a Family Restaurant and Music Venue – featuring Jazz and Blues. There are picnic grounds, an ice cream bar and a petting zoo for families with children. We are working on restoring the Gingerbread Castle itself, which has fallen into disrepair. We hope to have it open for tours again next season. The Gingerbread Castle was built in 1928. It was the dream of F.H. Bennett, who loved Grimms fairy tales. He hired Joseph Urban, world renowned Austrian architect, and designer of many ZigField Follies stages sets, to design the castle. The buildings were originally part of Wheatsworth Mills which eventually sold to the National Biscuit Company (now Nabisco). Bennett was also the creater of what are now Milk Bone dog biscuits. We have a website up now "www.frankscastlegrille.com" for the Restaurant/Music Venue and " www.thegingerbreadcastle.com" for the Gingerbread Castle. We are so excited!! Hampton Hotels, and its “Explore the Highway with Hampton Save A Landmark™” campaign has selected The Gingerbread Castle in Hamburg, New Jersey as its 21st landmark refurbishment project. As part of the campaign, Hampton Hotels in donating funding and volunteer labor to help repaint and landscape around the Gingerbread Castle. In addition to efforts put forward by Hampton, The Gingerbread Castle is running its own restoration program. We are collecting donations for restoration (see www.thegingerbreadcastle.com) and have heard from quite a few volunteers who want to help restore the Castle. In 1928, F. H. Bennett, inventor of Milk Bone Dog Biscuits and owner of Wheatsworths Mills, had a vision of creating a gingerbread castle with figures of fairy tale characters. He hired world renowned set designer and architect Joseph Urban to design the project. 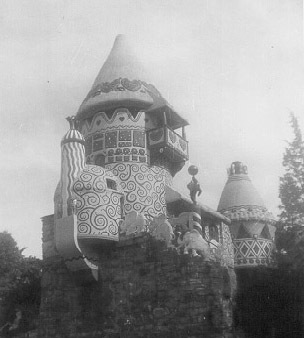 The Gingerbread Castle opened in 1930. It operated continuously for many years and became a tourist attraction for youngsters long before the establishment of today’s theme parks. Years ago, the Borough of Hamburg commemorated the Gingerbread Castle by establishing street signs shaped like the castle (many of which are still in existence today) and naming many of the streets after fairy tale characters. The police department also continues to wear a patch displaying an image of the Gingerbread Castle. Update: Frank's Castle Grille is now closed, and the properties are again up for sale. The restoration didn't get very far. The Gingerbread Castle is a great example of a replica castle from Europe. If you want to see the real thing, your best bet is to go overseas and snap some pictures of your own. There are plenty of hotels in London, Paris, Barcelona and Rome that are close to some of the most unique architecture the world has ever seen. Compared to cheap hotels, these castles are in a league of their own!